If you've been following my instagram feed now and again, you'll notice I started an 'Office Tea Club' at work. It's a nice way to get together and share tea. It's a time to decompress, learn, and taste. I receive many samples, and I love being able to share some with the group. We'll often learn about a particular type of tea, and we've even tried a few tea cocktails over the holidays. Since Valentine's Day is this week, I decided to serve the Palais des Thés thé des amants to the group. It was sent for review as a Valentine's tea, and I was excited to find out how well it paired with chocolate. Rich and sensual, Thé des Amants green tea is a voluptuous and fragrant blend of green tea with apple, almond and cinnamon, spiced up with a hint of ginger. 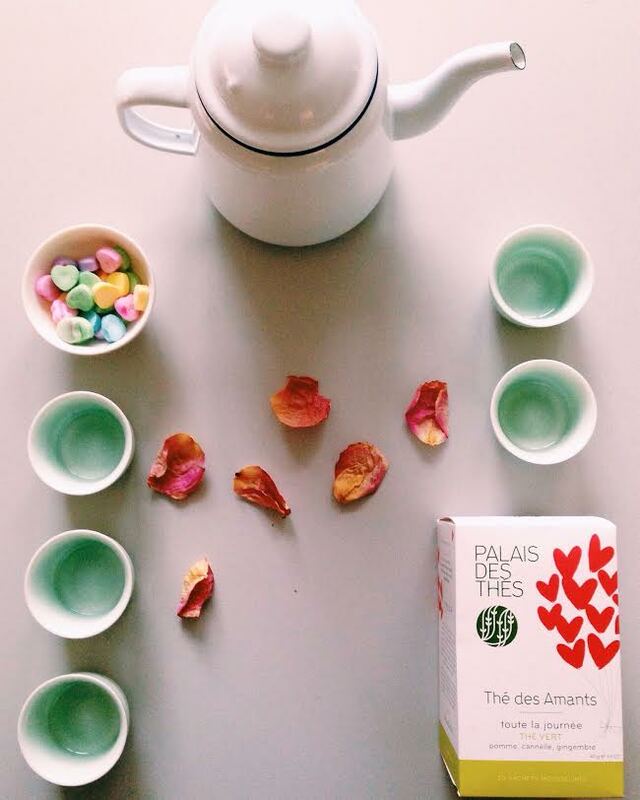 Meaning "Tea of Lovers" in French, Thé des Amants is a true celebration of love. The ingredients are green tea (China), apple, cinnamon, almond, natural flavor. The dry leaves smell mostly of apple and cinnamon. The brew has a nice combination of mellow grassy green tea, tart apple, cinnamon and a bit of zing from the ginger. There is a smooth nuttiness from the almond, but it's subtle. I was expecting more of a marzipan flavor but I didn't notice it. The tea has an aroma similar to an apple tart, which would make this a pleasing dessert tea. The majority of the Club members gave this tea a positive review, and I even heard a few happy sighs as we sipped. During our meeting we had the tea, dark chocolate and the necessary (and so disgusting) Sweethearts that are stamped with cheesy love notes. The chocolate wasn't the best hoice since the sweet, rich chocolate masked the more delicate flavors in the tea. But still, you've gotta have chocolate for Valentine's Day! A white chocolate or milk chocolate would probably be a better choice with this tea. The Sweethearts were more disgusting than I remembered, but there was one flavor that actually worked well with this tea! 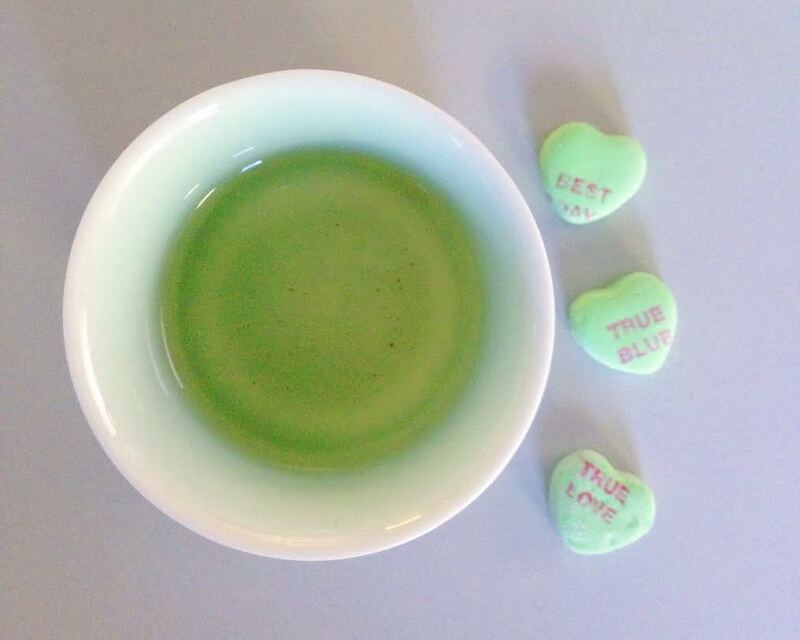 The green hearts tasted like an artificial version of sour green apple. These actually brought out the sweet apple notes in the tea. It was a surprisingly successful taste combination. Since I'm not a flavored tea fan I probably won't be sipping this on Valentine's Day, but I can see this as a nice choice if you enjoy apple pie and ginger flavors. It's sweet and a tiny bit spicy. I also like that you can actually taste the green tea. I imagine it would be good to bake with as well, perhaps to add to stewed fruit or even in a shortbread cookie recipe. Whatever you do this weekend, I hope you enjoy, and find some time for a sip with someone you love. Thank you to Palais des Thés for sending this tea. A little inspiration for my former French professor were she to view of this review/blog post. She does share tea with colleagues and students at the University; well I think that she does. No matter as you cannot know as you are in NYC. Take care Sara and not James. Thank you Melissa! So glad you enjoyed your family tea moment. That kettle is structured amazing. Great structure.